Photo courtesy of the Creede Balloon Festival. 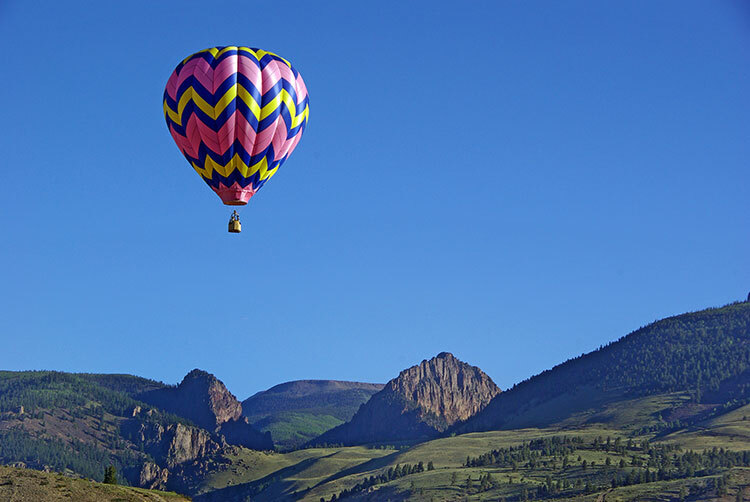 The Second Annual Balloon Festival is happening this Labor Day Weekend in Creede. There also a number of other fun competitions, a Salsa Fiesta, plus Sunday fireworks! This is the biggest to-do of the Creede Labor Day weekend, with events Friday through Sunday at the Mineral County Airport in Creede. The public is invited to view the balloons on the field and join in the festival parties for free. Festival sponsors can take a breathtaking scenic balloon ride on one of the 15 balloons participating this year. One-hour flights depart 7 a.m. each morning of the festival. Contact Chuck Powers at (719) 873-1741 for more information, including details on how to become a festival sponsor. The Balloon Festival isn’t just a beautiful spectacle and fun event. It’s also a fundraiser sponsored by the Creede Mining Heritage. This 501(c)(3) non-profit organization uses proceeds from the Balloon Festivals to restore historic buildings in the Creede area. This is a great cause for our community and 4UR ranch is proud to be one of the Balloon Festival sponsors this year. 7pm – Balloon Glow Party – Enjoy food, cocktails and live music. Weather permitting, the balloons will light up the evening with the magic of a balloon glow! At “dark-thirty” on Sunday, there will be a spectacular fireworks display sponsored by the Creede 4th of July Fireworks committee. Drive to the site just south of the Creede baseball park. Bring a blanket, chairs and a picnic basket of goodies and enjoy the show! Saturday September 1, 2012 starting at 11 a.m. on Creede’s Main Street. There’s free admission to the festivities which will include street vendors and live music. For the salsa tasting and voting, tickets are $8 for adults and $4 for kids age 10+. You can buy tickets at Creede.com or stop at the Creede Chamber of Commerce at 904 S. Main Street. Saturday September 1, 2012 starting at 9 a.m., this race has 22-mile, 12-mile and 2-mile runs. The challenging 22-mile run starts in Creede at an altitude of 8,800 feet and tops out at about the 11-mile mark at 12,500 feet. Registration is $25. For more details and registration information, visit Creede.com. Sunday September 2, 2012 at 10 a.m. Watch this fun free style soapbox derby on Main Street. Colorful contraptions must abide by three rules only: vehicles must steer, brake and stop. Powered by gravity alone, no motors allowed! On Monday September 3, 2012, watch the exciting Creede ATV Rodeo! Registration is at 10 a.m. and the competitions at the Mineral County Fairgrounds start at noon. The entry fee is $25. This family-friendly event features ATV riders competing in pole bending, barrel racing and both slow and fast skilled events. The circle track race has become a crowd favorite. Trophies are awarded for every class starting with age 6-10 years old and up. If you haven’t booked your stay at our Colorado dude ranch, be sure to do so in time so you can enjoy all the great activities at the ranch. During your stay, don’t miss all the fun at the Creede 2012 Labor Day weekend events!